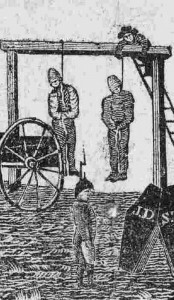 In April 1791, Thomas Mount and James Williams were thrown in the Newport, RI jail to be held until their execution for burglary. Williams was reticent to discuss his life or the crime that the two committed, but Mount not only willingly talked at length about these topics, he divulged the inner-workings of the “Flash Company”—a gang of “foot-pads and highway-men, connected together under certain laws and regulations”—to which he supposedly belonged. 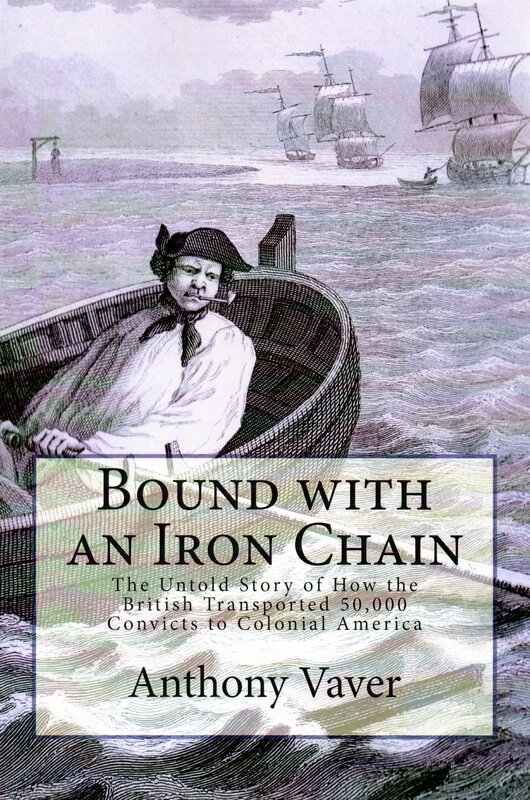 William Smith, the Newport minister who interviewed Mount in prison and then helped publish The Confession, &c. of Thomas Mount, contends that this “gang of plunderers has infected the United States ever since the late war; and almost all the persons who have been hanged of late in North-America, have belonged to this company.” The details of Mount’s life are not much different from other burglars who also published accounts of their lives during this time period. What is unique about Mount’s account is that he appends at the end a short cant dictionary and a group of flash songs that supposedly give insight into this league of criminals. Mount was born in Middletown, NJ in 1764, but his family moved to New York when he was four or five. He and his two brothers attended school, but Mount “played truant, hated learning and every sort of good instruction.” He robbed orchards on Sundays and spread his “wicked example among all the boys I could get acquainted with.” When he reached ten or eleven years old, he began to despise his parents, so he signed on to a ship bound for Antigua. At the outbreak of the American Revolution in 1775, Mount joined the American forces, although he soon became sick and was dismissed. After he recovered, he joined the army again, which started a pattern of him abandoning and rejoining armies throughout the conflict. While holed up in Valley Forge, he abandoned the Americans and joined the British army lying in Philadelphia. A few days later he committed his first act of theft when he and a couple companions broke into a shop and stole some soap. As the British army moved through New Jersey and up to New York, Mount continued to break into stores and steal goods and money. Afraid that he would eventually be detected, he joined two companions in locking up the corporal in charge of the patrol and escaped back to the American army. The British later recaptured Mount and charged him with desertion, but he was acquitted on account of his young age. At this point, Mount decided “to double my diligence, if possible to arrive at the head of my profession,” so he went on a spree of stealing watches and breaking into stores while still serving in the British army. While stationed on Long Island, he and another soldier stole two horses and rode off. They were both caught and tried for desertion. Mount was sentenced to receive 500 lashes, but he escaped from the guard house and headed toward the east end of the island. Once again, he was taken up, and while he was being transferred back to his regiment in a wagon, he picked the pocket of the man in charge of securing him and threw all of his papers out into the road. After reaching their destination, Mount told the officer that he saw the driver of the wagon pick his pocket and throw out his papers several miles back and used the diversion this story created to escape. 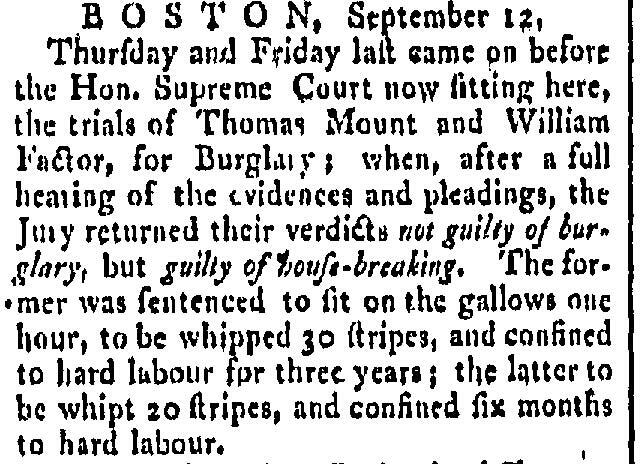 Salem Gazette - Sept. 13, 1785 - From Early American Newspapers, an Archive of Americana Collection, published by Readex (Readex.com), a division of NewsBank, inc.
At the end of the war, Mount devoted himself entirely to a life of crime. Eventually he was arrested for stealing and cutting up a silver tankard. 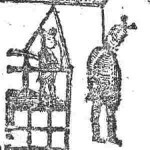 He received 100 lashes for the theft and an additional 25 “for giving the court saucy answers.” At another time he was taken up for burglary in Dedham, MA, and received 30 lashes, put on the gallows for one hour with a rope around his neck, and then sent to prison for three years at Castle William, otherwise known as Castle Island in Boston Harbor. After eighteen months of confinement, Mount escaped on a foggy day by swimming to shore. 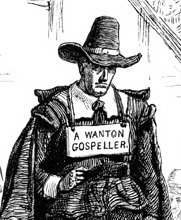 He is one of the most hardened villains that ever disgraced a goal in this, or perhaps any of the United States—glorying in his acts of villainy—boasting of his thefts, and of his adroitness in making his escape from confinement; expresses the greatest indifference at what may be his fate, and often observes, that a man is not worthy the name of a thief, who dreads the gallows. Mount’s downfall finally came in Rhode Island when he, James Williams, and William Stanton set out to break into Joseph Potter’s store. Mount first broke into a mill in order to obtain a crowbar to carry out the burglary of the store. The three took seven hundred dollars worth of goods and some money, but they were apprehended the next day. Stanton and his wife gave evidence against the other two in exchange for immunity. 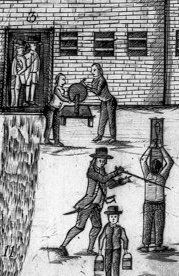 Mount received 20 lashes for breaking into the mill, but received a death sentence for the burglary of Potter’s store. 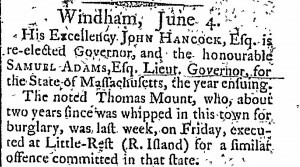 Windham Herald - June 4, 1791 - From Early American Newspapers, an Archive of Americana Collection, published by Readex (Readex.com), a division of NewsBank, inc. While Mount was held under sentence of death, he tried to escape twice but was unsuccessful both times. He claimed it was the first time he was unable to break out of any prison. Multitudes mourned and bewailed him—no triumph over his melancholy end disgraced the feelings of humanity—for the space of a quarter of an hour, nothing was to be heard but prayers, mixed with sighs and groans. Every face displayed the signs of being affected with the solemnities of his death, and the most tender sympathies of woe trickled down almost every cheek. 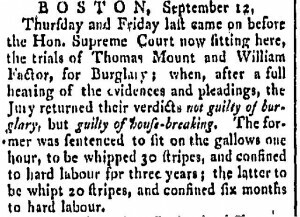 “Boston, September 12.” Salem Gazette. September 13, 1785, vol. IV, issue 205, p. 3. Database: America’s Historical Newspapers, Readex/Newsbank. Mount, Thomas. The Confession, &c. of Thomas Mount. Portsmouth, [NH]: J. Melcher, . Database: America’s Historical Imprints, Readex/Newsbank. “Portsmouth, Sept. 8.” Essex Journal. September 15, 1790, issue 324, p. 3. Database: America’s Historical Newspapers, Readex/Newsbank. Providence Gazette. April 16, 1791, vol. XXVIII, issue 16, p, 3. Database: America’s Historical Newspapers, Readex/Newsbank. “Rhode-Island. New Port, June 2” Vermont Journal. July 5, 1791, vol. VIII, issue 414, p., 3. Database: America’s Historical Newspapers, Readex/Newsbank. Williams, Daniel. 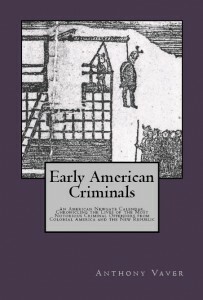 Pillars of Salt: An Anthology of Early American Criminal Narratives. Madison, WI: Madison House, 1993. 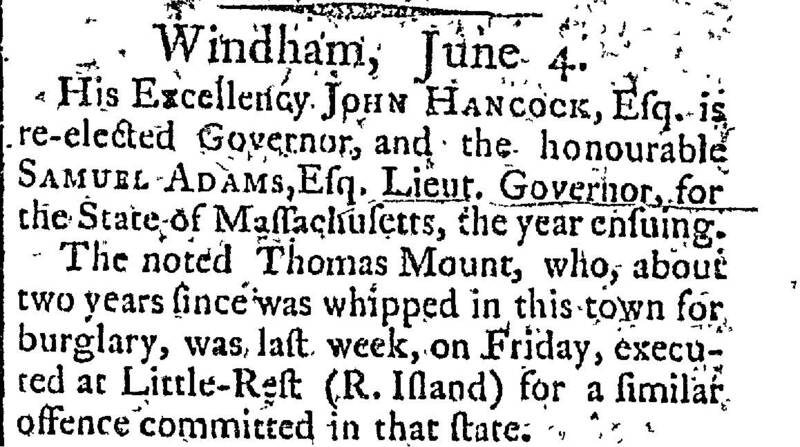 “Windham, June 4.” Windham Herald. June 4, 1791, vol. I, issue 13, p. 3. Database: America’s Historical Newspapers, Readex/Newsbank. This was written by Anthony Vaver. Posted on Wednesday, September 22, 2010, at 11:55 am. Filed under Criminals. Tagged Burglary, Connecticut, Imprisonment, Maryland, Massachusetts, New Jersey, New York, Organized crime, Pennsylvania, Punishment, Rhode Island, Virginia, Whipping. Bookmark the permalink. Follow comments here with the RSS feed. Post a comment or leave a trackback.